We're going to have some remodeling work done on the house, meaning that we'll have a crew of people we don't know in our home for a week. And while they work for a reputable local contractor, there's something a little unsettling about having strangers in your house while you're not there. While we could burn some vacation and babysit the crew all week, that seems to be a bit of overkill. It seems more reasonable to take some simple steps to "help honest people stay honest." To that end, I've installed key-locking doorknobs on the master bedroom and closet, since access to those rooms won't be required for the work. However, our bedroom door opens outward, with the hinges exposed, so that a lock can be thwarted by popping out the hinge pins. Again, it's highly improbable that anyone is going to try that - but there's a simple solution that will remove even that little bit of insecurity. I've installed a couple of secure hinge plate studs. As a public service, because step-by-step instructions are lacking on the web, I've documented the process in case you're interested in doing the same thing at your house. The concept is simple. The stud is installed into one side of the hinge plate, and it protrudes a quarter inch or so. 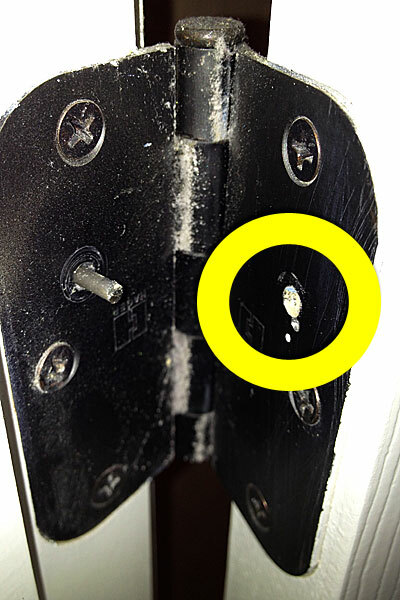 A hole is drilled into the other side of the hinge plate, directly offsetting the stud, and when the door is closed, the stud fits snugly into the hole. 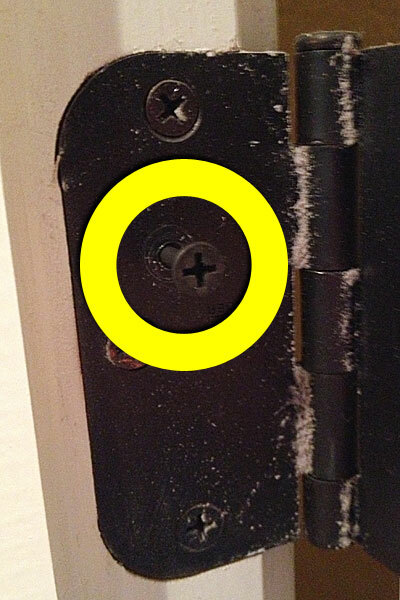 Even if the hinge pins are removed the door can't be lifted or pulled off the hinges. First, pick a drill bit just slightly larger in diameter than the body of the screw. 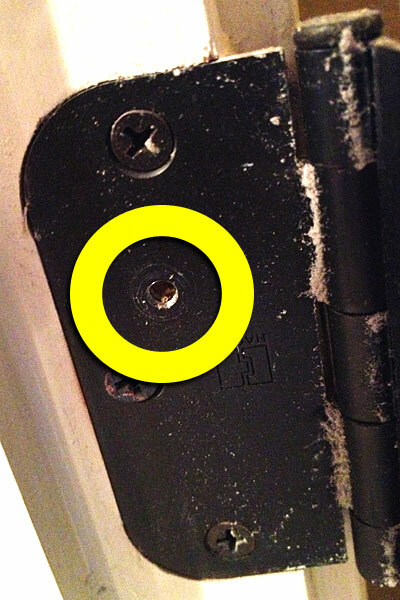 Drill a hole into the side of the hinge plate mounted on the door frame. Be careful to drill only through the metal of the hinge plate and not all the way into the wood. 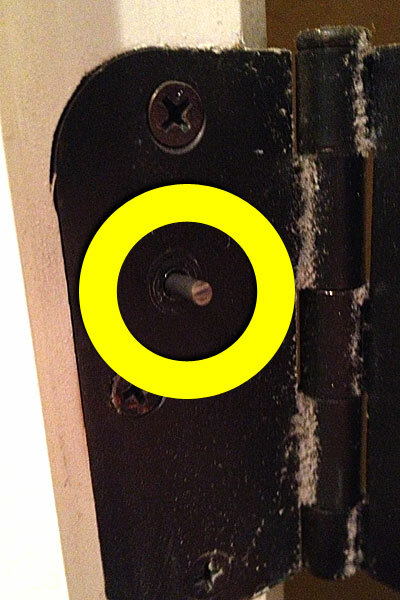 You'll want the screw to fit tightly into the door frame. Yes, our door hinges are dusty. Don't judge. Insert the screw leaving about 3/4" sticking out. 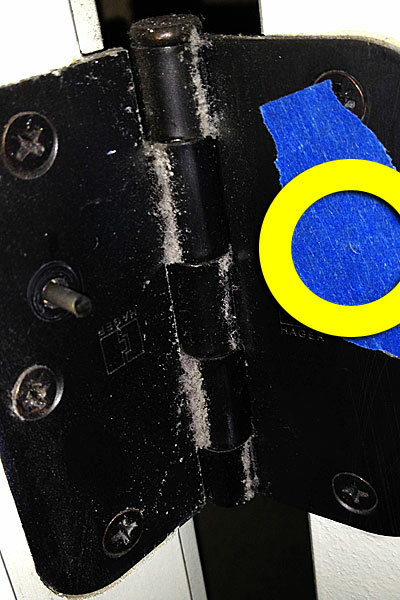 You'll transform this lowly screw into a rugged stud. Using a Dremel or other rotary tool with a cut-off blade (or a small hacksaw if you have room to use it), slice the head off the screw so that about 1/2" protrudes from the hinge plate. It doesn't look like much, but appearances are deceiving. Next, you'll drill the hole into the other side of the hinge plate, into which the stud will fit when the door is closed. But, you ask, how can I make sure I'm drilling in just the right spot? That's where the masking tape comes in. Apply a piece of tape across the hinge plate where the hole will be drilled, and close the door gently but firmly so that the stud leaves an impression in the tape. Voila! That's where you drill. It's hard to make out, but the indentation is definitely there. Drill a hole using the same bit as before, but this time, drill all the way through the metal and into the wood far enough to accommodate the stud. And that's it. You'll want to repeat this at least once more for maximum benefit - studs on the top and bottom hinge plates will be the most effective placement. If this seems like too much work, you can always order security studs, but even then you'll have to do some drilling. This page contains a single entry by Eric published on September 27, 2013 3:32 PM. Fall Fredericksburg Fandango was the previous entry in this blog. Stalking the wily Punica granatum is the next entry in this blog.